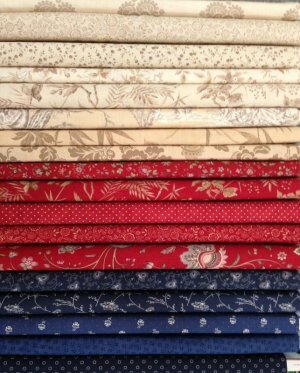 Try something crazy and unpredictable and start a Mystery Quilt! Each month we will add a new set of instructions for this beautiful and easy quilt pattern. We also have a kit available for those of you who don't like too many surprises! Limited Supply of Mystery Kits Available! Organize your reds, creams and blues into groups of three. 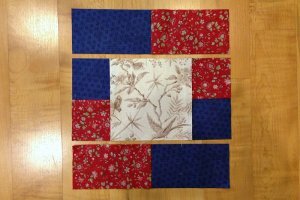 This is a scrappy quilt with 20 blocks but in every set of 4 blocks will have the same red, blue in cream in it. Cut 1 - 3 1/2" strip from each blue and red fabric. Sew each blue and red strip together matching from your groupings you chose above. Press your seams towards the red. Subcut 8 - 3 1/2" rectangles from each sewn strip. 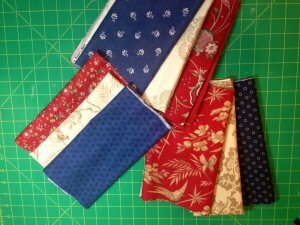 Cut 1 - 6 1/2" strip from each blue and red fabric. Sew each blue and red strip together matching from your groupings you chose above. Press your seams towards the red. Subcut 8 - 3 1/2" rectangles from each sewn strip. 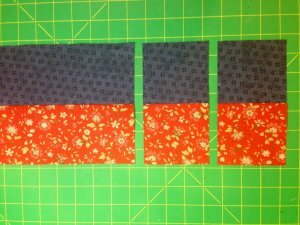 Cut 4 - 6 1/2" squares from each cream print. Keep each cream with it's matching blue and red sections from above. Sew a 3 1/2" x 6 1/2" section from step one to each side having the blue toward the top on one side and towards the bottom on the opposite side. Sew a 3 1/2" x 12 1/2" section to the top and bottom having the blue touching the blue side pieces. The blue with be towards the right on the top and towards the left on the bottom. You will have 20 blocks. Sew them together 4 rows across by 5 rows down. Add a 2" inner border and a 8" outer border. Quilt and Bind as desired. Enjoy!